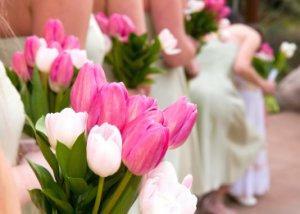 Wedding colors for a spring ceremony create a bright and fresh seasonal event. Spring colors are a great choice for a May garden wedding. They can also be a welcomed burst of color for a fall or winter wedding. This wonder palette of colors offers a variety of ways to create a stunning wedding. What Are Spring Wedding Colors? Traditionally, spring colors are pastels. If you are looking to work spring shades into your nuptials, you'll want to stay away from dark and sharp shades such as deep oranges, navy blues, and bright reds that are often associated with other seasons. Soft colors that are appropriate include lavender, baby pink, mint green, yellow, and pale blue. If you enjoy a more vibrant color palette, try a vibrant turquoise or hot pink blended with more muted hues. Light green and baby pink can represent budding blossoms, and can easily compliment small clusters of petite flowers tied to reception napkins. A combination of melon and a deeper pink can conjure up mental images of a perfect spring sunset, and goes well with floating candle centerpieces at an evening affair. Light blue with crisp white or ivory is reminiscent of children's Easter attire, and your flower girl may look gorgeous in this color scheme, adding a little Sunday best to your big day. There are plenty of ways to tie in patterns and other feelings of spring into your wedding ceremony and reception. In fact, you can simply work a theme of feminine delicacy into your entire wedding from invitations to wedding favors using elements of spring. Gingham ribbon is beautiful tied around invitations, bouquets, table vases, and even in the hair of young female attendants. Many popular bridal salons such as David's Bridal have begun to work gingham into the waistlines of their bridesmaid dresses, adding a springtime flair to an otherwise traditional looking wedding party. If you have a fun loving personality and want to include some of that zest into your wedding décor, look to polka dots. They are fun without being childish, and can be beautiful in spring wedding colors. Pale purple polka dot napkins are a sweet accent when paired with solid colored or ivory china. An appropriate wedding favor may include a polka dotted votive candle for each guest, or perhaps a round candy wedding favor personalized to your wedding colors. 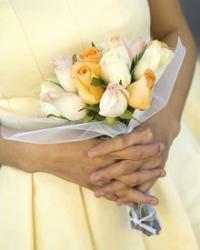 When planning your wedding colors, keep photographs and video in mind. These will be your lifelong mementos and you do not want to look back in regret if something ends up coming across as tacky or unattractive. It is better to go with classic rather than trendy. Keep things simple and set the scene. An actual spring wedding will suffer from not having the proper outdoor backdrop, unless you happen to get married right at the height of blooming. Coordinate with your florist to get a picture perfect backdrop of either silk flowers or perennials grown indoors to accentuate your photos with the appropriate spring color. You can also compensate for a lack of ideal foliage by converting your favorite shots into sepia or black and white, or asking your photographer about color enhancing software. The magic of computer technology can fool your photo album into showing springtime greatness that may or may not have actually been present on the big day. If you are having a wedding with springtime colors during the autumn or winter months, make sure your guests are fully immersed into your contradictory theme. Make sure every detail has spring colors worked into them, so you don't have a conflict of fantasy and reality at your nuptials. At the same time, take care not to overwhelm your wedding decorations, and instead opt for a beautiful blend of spring and other seasonal hues. Spring wedding colors are delicate and beautiful, and there are many ways to incorporate the elements of spring into your celebration with style, no matter what your wedding date.